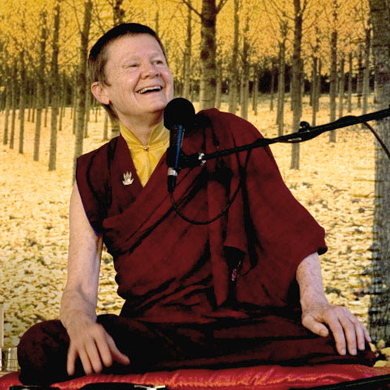 Pema has been teaching and writing extensively for the past two decades. In 2006, The Pema Chodron Foundation was founded in order to help ensure that Pema’s work can be supported sustainably into the future. The current focus of The Pema Chodron Foundation is the creation of an endowment to hold and generate the funds needed to help share Pema’s teachings of how to ‘practice peace’ in our lives and communities, and to support those who choose to lead a contemplative life. 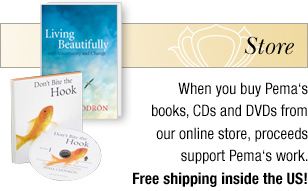 The royalties from all of Pema’s books and tapes are held by the Foundation. In addition, gifts and honoraria generated by Pema benefit The Foundation. Pema needs your help. While she has taught and published widely over these past years, and has been at the heart of the creation of her home monastery, Gampo Abbey, she needs your help to make her dream of sharing peace in the world a living reality. Any help that you could offer would be tremendously helpful and greatly appreciated. 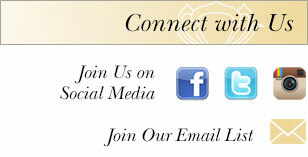 Pema Chodron Foundation is a tax-exempt organization under Section 501(c)(3) of the Internal Revenue Code. Contributions are tax-deductible, as allowed by the law.